Cape Cod + Summer Evening + Wine = Perfection! My research for great wines to serve my guest at our Cape Cod Bed and Breakfast never ends, and I love it. If you follow my wine-ings, you may have picked up on my preference for red wines. Last week, I jumped at the chance to help at Cellar 55’s and Belfry Bistro’s tasting that featured all California reds. As dark and stormy as the tasting the week before had been, this night was a picture perfect Cape Cod summer evening. Paul Russo, the Fine Wine Consultant for Masciarelli Wine Company, did the honors of introducing the wines for the evening. 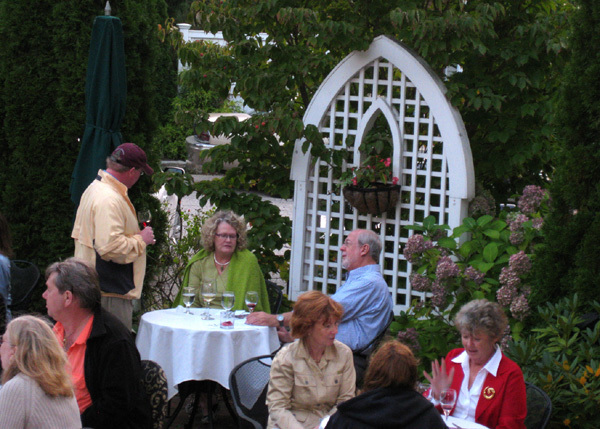 The program listed four wines from the Siduri Winery and the Novy Family Wines. Paul gave us the interesting family background that ties these two quality producers together, and I also found a lot of facts on their websites. The winemakers for both wineries are Adam Lee and Diana (Novy) Lee. Together, they fulfilled their dreams by starting Siduri and achieved success as a nègociant producing highly rated Pinot Noirs with grapes from the best vineyard from Santa Barbara, California to Oregon’s Willamette Valley. Adam and Diana and some Novy family members expanded into other varietals under the Novy Family Wines brand. They are literally a "warehouse winery," which means exactly what it sounds like. Both Siduri and Novy Family Wines are produced in a warehouse facility in Sonoma County. They say, “It's low frills, but it allows us to make great quality wine and offer a much more personal tasting experience to our visitors”. I have had wines from both labels, but was unaware of the interconnection and would love to visit them on my next trip to Sonoma. With this bit of family history, we started the tasting with two Pinots from Siduri. I have always liked their colorful label, which depicts the Babylonian Goddess of wine, Siduri. The website explains that, in Babylonian mythology, the goddess Siduri held the wine of eternal life. My doctor must agree with the Babylonians since he recommends a glass of red wine a day, and I do my best to follow my doctor’s orders. Our first Siduri was the 2009 Sonoma Coast Pinot Noir paired with a Long Island Duck Leg Confit. This was followed by the 2008 Santa Lucia Highland Pinot Noir paired with a Prosciutto and Arugula salad. I was too busy pouring to enjoy the pairings, but had time to taste the wines side by side. I had the blended 2008 Sonoma Coast last year, but never the single vineyard Santa Lucia Highland. Wine Spectator rated them both over 90 points and I liked them both, maybe leaning slightly to the 2008 Santa Lucia Highlands. From the Novy Family we started with the 2009 Novy Four Mile Creek paired with a Braised Pork Belly. I discovered this wine last year at Cellar 55 Wine Merchants and have worked into my guest wine offerings ever since. Although I could not find the exact percentages for 2009, in the past this has be a nice blend of Grenache, Syrah, Zinfandel, and Pinot Noir grapes form some of California’s most famous vineyards. The winemakers take some of the best grapes they have not used for the single vineyard Siduri and Novy wines and makes this easy drinking red table wine. It went great with the pork. Our last wine was the 2009 Novy Sonoma County Syrah paired with a Malted Milk Chocolate Shake. Last years 2008 Syrah was my first introduction to the Novy Family Wines and the 2009 lives up to my expectations. And what’s not to like about red wine and chocolate, hands down my favorite paring of the night. Another great night of wine and food, it’s all in a day’s work for me. I am a lucky man.